I got a call from my buddy, Ken, yesterday asking if I was interested in a road trip. Since all I had to look forward to was doing work around the house I immediately agreed. “Sure, but where to?” I figured that I could still back out if I needed to. He said that he needed to go to Acme to pick up a trailer and then drop it off in Strathmore. This sounds kind of fun. Not only didn’t I know that Acme was relatively close by, but to find out that the Coyote actually lived in Strathmore was pretty cool. 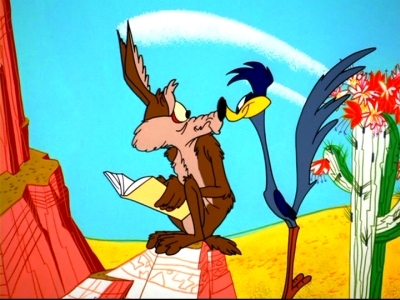 Throughout most of my childhood and really up until yesterday I thought that the Coyote lived in Arizona. I was going to ask Ken what we were going to deliver to the Coyote but decided it would be best if it were a surprise. He picked me up and we started out, only to find that the road we planned to take was getting a manicure of some kind. Thank God for GPS. Turn that baby on and Ba-Boom! You have an alternate route in minutes. We talked of hawks that were flying and all of the water that is still in the fields while we drove through a beautiful southern Alberta day. I could barely contain myself! In fact I guess in retrospect I should have gone potty before getting in the truck. Control! Control! Control! I see the sign that says Acme and feel a little let down that it looks just like any other small Alberta town. We pull into the storage yard and wait for the Jay to come meet us with the trailer. I’m thinking blue Jay. After a phone call and a ten minute wait the gate to the storage yard opens up and a van comes out. It is Jay’s wife (not a bird) and she tells us to go through the gate. Yeah, when you want to meet someone the best way is to be hiding behind a locked gate. I’m not feeling the love!. The trailer is just that, an old, rusty trailer. No big boxes or crates with the ACME label. WTF? Ok, so I still get to meet the Coyote when we drop off the trailer. We drove back through the same beautiful southern Alberta day, with the same hawks and ditches filled with water. This is beginning to remind me of the whole Tooth Fairy fiasco. Here is Strathmore coming up and there is no “Welcome To The Home Of The Coyote” on the town sign. Hmmmm! We go to this nondescript warehouse and walk in. This is it, this is where he makes all of those fantastic machines! Kind of like a back stage pass to the North Pole. Nope. Just some bald guy and his son who will let us store the trailer in his compound. Ken backs the trailer in and asks me to find a rock so that he can block the wheels. I was looking for a rock already, but it wasn’t for the wheels. Lesson learned, you will probably never meet your heros. Just so the day wasn’t a total waste we went to the Strathmore Tim’s for a coffee. Now, let’s put a little icing on the cake. The woman in line behind us had just filled her gas tank with diesel and couldn’t carry on back to Saskatchewan until the tank was drained. I put a concerned look on my face and discussed with her what her options were. I didn’t laugh at her once! Just goes to prove, you can make lemonade out of lemons but you can’t cure stupid. OK, so now I had to make sure that I got the car there on time. There was a time in ‘the good old days’ when you could count on things never changing. If you needed construction work done quickly, two Italian guys with a wheel barrow would never let you down. Anything and everything from Japan was crap! You can always trust the mailman. Dentists usually died early by their own hand. Police kept the peace by just being there. Oh, and anyone to do with car sales and repair were slimy, cheating bastards. Louise and I showed up on time and were greeted by Jason the service rep who seems to be one of the nicest, most agreeable, clean cut and sympathetic young men I have ever met. He “facilitated” our “experience”, printing up the work order and getting us to sign it and out of the service check in area, before we knew we had been in. Hey, that was pretty painless! Just an oil change and fluid level check, my kind of service. A couple of hours later I get a call and a sinking feeling from Jason. It turns out that the transmission fluid needs to be replaced. Hmmmm. “How much?” (WHAT?) “OK”. “Great” Jason says. “That is just about it except for the front brakes, which need new pads and the drums need to be turned. Oh and the rear brakes pads are in great shape but there is scoring which needs to be attended to . Once this is done you are good for years.” I could see his smile hanging in the air in front of me. “Oh…so…how much?” It is a good thing we keep smelling salts in the house. Well, I guess that’s what money is for, and it costs for the convenience of a vehicle. Yadada, yadada! I am sure that if there is Karma in this world there will be a special kind of Hell for all of the people that are so very nice while they are bending you over and doing a not so delicate surgery on your wallet. You know, I’m a nice guy. There must be a million people out there that I can screw over with a smile. When I looked out of my front window this morning, I couldn’t help but notice what a beautiful day it was. Oh, and the two front end loaders, three trucks with trailers, a man trailer for planning, breaks and I guess alcohol and drug storage, and of course an assortment of city workers in varying degrees of not working. I was surprised because somehow they had appeared without making any noise. It is nice to know that they do at least one thing very well. The guy in one of the front end loaders had to have been 350 pounds, and not all of it muscle. I looked but couldn’t see anything that resembled a man sized shoe horn or 50 gallon barrel of grease which would have been needed to wedge him into the cab. He seemed comfortable though, what with the rhythmic breathing, closed eyes and a hint of drool slowly making a pool underneath the backhoe. Maybe that is the leak. Two or three hours later I went out to see what they had accomplished and wasn’t terribly surprised to see the equipment and men in pretty much the same state as they had been. Tax dollars well spent. I learned that there was a leak somewhere around the corner, but because of a faulty valve in front of my house they were unable to find it until the valve gets repaired. Due to cost cutting measures the workers that at one time did maintenance are no longer doing that job, which means that these problems come as a big surprise to everyone. Score one for the bean counters! When work eventually commenced there was a whirlwind of activity. Back hoes were digging, dump trucks were loading, three or four guys and one token woman were leaning on shovels, brooms or whatever happened to be handy and the right height. The result is a big hole surrounded by plastic fencing, a large pile of dirt, flashing lights and the afore mentioned backhoe. The only time these guys were working quickly was quitting time. The good news is that for whatever reason, the pipe in front of my house doesn’t service my house, so my neighbours on the other side of the road should start to smell badly really quickly. OK, most of them already stink, but now they do have an excuse. It should be interesting to see how far the work progresses tomorrow. Actually it will be interesting to see how many tomorrows pass before any work gets done. I haven’t been feeling 100% since returning from vacation, which is probably a combination of jet lag and my ability or should I say lack of ability to deal with it. Not to mention that the temperature is about 30º colder here. I had almost forgotten what cold felt like. Yep, now I remember and it isn’t even what I would consider cold. Back to the real world. On a happier note I think I killed a few baby birds yesterday. Now, before you get all teary and start talking about Earth Day and baby seals, these weren’t birds that anyone likes. I didn’t really kill any birds, just some future birds. Not birds from the future, which would be weird and exciting at the same time, but rather potential birds. You see a before we went away I noticed a couple of magpies ( http://en.wikipedia.org/wiki/Black-billed_Magpie ) talking to a developer Crow and putting a down payment on the tree in my front yard. It is actually Arwen’s Arbour Day tree from grade three which like many of her things, is still at my place. I knew I had to nip this in the bud since I was going to be away for a while, so I got out the ladder and a big stick and knocked down their construction. Job done! Fast forward a few weeks and the first time I look out the window at the tree I see a two or three story home in Arwen’s tree built of mud and sticks. I guess these particular Magpies never read about the Three Little Pigs and the moral of the story. I‘ll play the big, bad Wolf. Heh, heh, heh! They should have built with bricks. Now, after I had put the ladder away and was looking at the heap of mud and sticks in the front yard I see the two magpies. I can hear the conversation now. “Well, this isn’t our tree!” she said. “Of course it’s our tree. Don’t you think I would recognise our tree when I see it?” he blustered. “Well, I know it’s around here somewhere. A house doesn’t just get up and fly away.” He countered. I don’t speak bird, but I have been in the middle of a similar conversation myself and I don’t envy that poor slob. Well, another day... another life crushed! I suppose that I should do some kind of a synopsis of our trip to Paradise. My impressions if you will. All in all it was a very enjoyable time. Now, as you may imagine there is a but. Lots of butts, but far too many to mention, except for that one on Waikiki Beach on April the 8th at about 1:41 PM. You know who you are, I mentioned that I thought that you had your bikini bottom on backwards. Talk about a fashion faux pas! We spent the first three days in Honolulu, about four blocks from Waikiki Beach. Our room was tiny and we were right beside the elevator so we could keep track of all the comings and goings throughout the night. We climbed Diamondhead which is a must and had the first of many shaved ice’s. The main drag kind of reminded me of the Vegas strip without casinos and clothing. Fair trade off I would say. Lots of tourist shopping and dining. Three days was plenty for us. We met a couple that own a hotel room (they do that there) and if you need a reasonable place to stay in Honolulu here is their website. http://www.waikikitropics.com/ .It was fun waving to the people in Canada from in front of Duke Kahanamoku’s statue http://www1.honolulu.gov/multimed/waikiki.asp . We looked pretty odd, but it was cool. I also walked down to another web cam at The Moana Surfrider Hotel which I had been visiting for years after spending very cold days delivering mail. Pretty neat! The next week we stayed at a million dollar home in Kailua with five other people. We were walking distance to the beach in one direction and a nice sized town with all of the amenities in the opposite direction. We made use of the pool and the back yard. Oh to be one of the idle rich instead of just being idle. Louise took her paddling course and although a little nervous at first she enjoyed herself immensely and hit a few milestones in her paddling career. Paddling a single and double outrigger in the ocean and paddling from Waikiki to Diamondhead in a six man outrigger and surfing the waves. Pretty cool! She learned a lot about technique and gained confidence in her ability. I spent my time soaking up the rays, beach walking and gawking as well as talking to any who would listen to me. I learned a lot about Hawaiian people and the melting pot that is Hawaii. For our final week we moved on to the North shore which is where they have those huge waves that Oahu is famous for. Yeah, not this week! Our apartment was somewhat less than the million dollar home of last week, but after the initial shock it was quite nice. Oh well. We went to the Dole Plantation http://www.dole-plantation.com/ , the Macadamian Nut Farm http://www.macnutfarm.com/ , Turtle Beach (which is awesome by the way), Waimea Valley http://www.waimeavalley.net/ , Shark Cove, a huge swap meet, The Hukilau Café http://www.youtube.com/watch?v=QnV6__JKSvI (which is a dump, but has great food). We actually drove back to Kailua twice to enjoy the beach there as it was more to our liking. The North Shore is more of a surfer paradise and attracts a younger more hippie type crowd. Would I go again? You bet! I would take a lot less clothing and wouldn’t let Louise have any money or charge cards. I would plan the trip to stay in Kailua and do day trips from there as it is a small island and nowhere is more than an hour away. If anyone is going and wants a sulky, grumpy somewhat boring tour guide, just let me know. So begins the final day in Paradise. The plan, or should I say my plan, is to have a quiet laid back day of sun, surf and introspection. I begin with a cup or two of the finest 100% Kona coffee. Life is good! We walked up the shore to Sharks Cove hoping for a photo Opp or some other stunning visual display. They call it Turtle Beach because there are lots of Turtles. I was kind of hoping that with all of the snorkelers in Sharks Cove we might get a real interesting show. Nope, just people face down in the water and still breathing. Could it be that paradise has let me down or have I come to expect too much? We went to Foodland and got a couple of drinks and pastries which we took to the beach to enjoy while watching the ocean. Nope, I haven’t been let down. What a nice way to begin a lazy day. We went back to the apartment I saw a local hippie hanging out the wash. After lunch we went back to the beach, but this time to frolic in the surf and soak up some rays. The waves were the largest we had seen, and were a lot of fun to play in. Now, after a while everyone started to leave the beach and we did too thinking that it was 4:30 or 5:00 . Turns out that it was 3:30 . Oh well, good time to shower and stress about the flight tomorrow. I know, nothing to stress about. CARS DON’T DRIVE THEMSELVES TO THE RENTAL CAR COMPANY! PEOPLE DON’T CHECK THEMSELVES AND THEIR BAGS INTO THE AIRPORT! OK, the last one is wrong. We had a wonderful dinner on the patio, watching the sunset over the ocean. Picture perfect! Great idea Louise! I went to bed early ( 9:00 ) after we packed, because 3:30 comes early, and lay awake until about 10:30 . Pretty smart. I’m definitely on the wind down part of the vacation. Most of the things that we had planned to do have been done or scratched off of the list. For the rest of our time in paradise it will be sun and surf. Today we decided to drive to Kailua one last time. It has the beaches that we like and it feels like home away from home. Minus the snow of course. This being a Saturday there was more activity on the beach than during the week. From four PM till noon the next day the parking lot will be closed due to a triatholon. There was also a large group of Hawaiians having a first birthday party, with an inflatable castle slide, large event tent and tons of food. I asked if a big first birthday party was a Hawaiian tradition. One guy looked at me and said in an ice cold voice, “It’s Samoan.” Of course I apologized while I wet myself and backed away very slowly. Now, after my near death experience the rest of the day fell together nicely. We took a dip in the ocean and stored up more than our quota of vitamin D. I talked to a woman about the Kobo reader and it’s good and bad traits and the new Jean Auel book. Her husband and herself came from Oregon this year because the husband worked for Coke and could get a transfer. They felt that they had come home the first time they came to Hawaii in ‘98 and had been trying to move here since. They asked if we were interested in a home in Oregon. We solved some of the world’s problems and then went back to the sun tan. It was fascinating watching everyone walking by and playing in the surf . Now I am not a runway model, but some of these Humma-hungas made me feel positively petite. They had hair, oh my God they had hair! Some seemed to drag it in the sand. Funny thing about hair, on some people, or should I say most people what they have on their heads and face suit them. It is the tufts of hair sticking out willy-nilly from the oddest places that had my lunch parked midway between stomach and mouth. I made sure that I had a Brazilian before I came to Paradise. I am that thoughtful! One more day of wallowing on the beach in paradise and then back to the snow shovel and Tim’s coffee…Yea???? No rooster this morning, so I expect that there was a BBQ last night. I wish I had been invited. Today’s journey involves finding Turtle Beach. Turns out that The Turtle Beach Resort is actually The Turtle Bay Resort. Still a turd hole if you ask me. We know that it is somewhere between here and Hale’iwa, so we have driven past it numerous times in the past few days without seeing it. We checked out our hard copy maps, studied the satellite view on Google Maps and I sacrificed an ant to Lono the Hawaiian God of learning. No stone unturned and no leaf…unleafed (? ).The guide book said to look for a lot of cars parked at the side of the road and pull in there. Pretty simple really. Yep, found it. Normally, whenever you hear about a place like Turtle Beach it is a place where sometime in the distant past someone had seen a turtle. Not so for Turtle Beach! The place is fully stocked with turtles large and small. 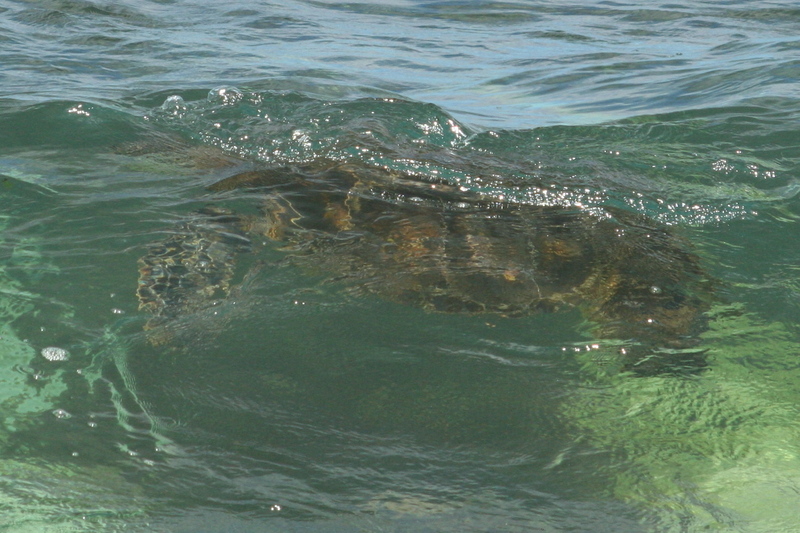 They swim right where the surf breaks which makes for some wonderful photo opportunities. They also let the waves bring them up on the beach and then reverse surf back into the ocean. Pretty impressive all in all. We spent quite some time being entertained by Toby turtle and friends and afterwards we spent an hour or so sitting on the beach watching homo sapiens in their natural habitat. Strange creatures! I can only go so long before I need a re-fueling stop. I am pretty sure that the engine isn’t working at peak performance anymore, it comes from years of neglect and abuse. There is reincarnation in my future, so I get a new body and new life to try not to screw up. We stopped at a place called Jameson’s Pub and I ordered a Reuben while Louise opted for the Veggie burger. Both were very nice. You know, this place should go into the tourist business, they would make a fortune. For desert (yes, we felt we needed desert) we had a macadamian nut ice cream pie with an oreo crust. Yep, it was just as awful as you might think. I don’t know about you, but I didn’t sleep well last night so it is off to the room for a well earned nap. I know why farmers tend to make an early start to their days. It takes time to wring the bird’s neck, pluck the feathers off and then gut it so that it will be ready for dinner later that day. Why not just knock on the front door and ask to be eaten? I am guessing that is why we refer to the dim witted as bird-brained. Or supervisors. We heard that Calgary had about a foot or 20 centimeters of snow overnight. That really drives home the fact that every cloud has a silver lining. Well, not for anyone in Calgary. Today Arwen told us of a place she saw on Man vs. Food and really it was a dare that we had to take up. The place was in a town called Laia. It is the home of Brigham Young University Hawaii chapter. Kind of the opposite of the Hawaiian Chapter of the Hell’s Angels. So, the place is called The Hukilau Café and is home to the famous Hukilau burger. We had the steak sandwich and it was exceptional! The prices were very reasonable and the service was…well, we were served. The gentleman at the next table had the burger and he assured us that it was more than fantastic. Mind you, his opinion might not count since he was an American and a diver. We went across the street from the café and sprawled out on Laia beach. Louise was driven to walk almost to the horizon along the beach while I was stuck guarding the stuff. Never you mind what stuff! It is important stuff that we can’t afford to lose. It was a very quiet beach, with virtually no Mormons at all. It is hard to tell there were no Mormons because they tend to blend into most situations but I think I would have noticed two guys with black pants with a white shirt and tie on bicycles pestering people on the beach. There was a guy from Brazil or Equator or Chile, but he was older, in a bathing suit and I didn’t see a bicycle anywhere. Our next and last stop was at The Turdhole Beach Resort. It was very nice, having a golf course, condos, a hotel and what else?? ?…hmmmm…oh yeah, a beach. We had the bar and restaurant recommended to us, but since it was $5 to park for over ½ hour we decided to leave. Strange name though? You would think that a name like that would drive people away. 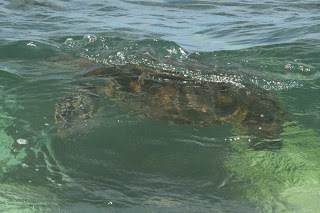 Oh, Louise informs me that it is called The “Turtle” Beach Resort. That makes more sense. My bad. Just between us, it did seem to be a bit of a turd hole. We went back to the room and sat around sweating for a while. I know how to have fun! For dinner we walked over to an old bus that serves up fresh shrimp. How can this go wrong? Luckily, I will be eaten by shrimp before I eat a shrimp. Hot dogs deluxe for me! How can this go wrong? We sat and watched the sun set. No wonder the water is so warm. Every night the sun takes a dip. Well, another day in paradise. I guess it is because they came from all over to wake me up at 5:00 AM. Who the hell keeps roosters? There are chickens all over the place. Forget the wild pigs, I am getting concerned about poultry. So you think there are feral chickens? Should I be worried? I am sleeping with one eye open, well, only till 5:00 AM of course. We drove into town after a leisurely breakfast and checked out the typical tourist shops. I bought a great Quicksilver fall/spring jacket at the Northshore Boardriders store. Eat your heart out Chris. I met a US Postal worker named Daniel and had a nice chat with him. I always like to talk to one who understands that the struggle continues when I go to strange places. Only one in uniform understands the pain and suffering we go through to keep people informed. I did that all with a straight face. We had lunch at a place called Konos. Grilled pastrami and a chocolate shake. Mmmmm…mmmmm good. Just a little more shopping and then back to the room for a power nap. We went to the beach for the rest of the afternoon and I was mesmerized by the waves. They are very impressive here. The beach wasn’t terribly crowded, but very nice. The ocean is really salty here. I wonder if there is an ocean that tastes of pepper? There was a bit of a problem however. I heard some yahoo yell out “Hey, look at that whale and his blowhole!” I had him facedown eating sand before I realized that he was talking about a whale in the ocean and not me. Pretty cool to see that massive thing. Just saw a Gecko in the room. I don't hang out in his place, why is he here?